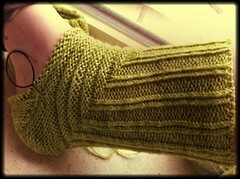 What's a pleasure for some of my kitting friends, like Dominique and Rozemie, just doesn't come easy to me: sock knitting. Fun, small portable projects, fast or challenging knits, colourful (if for the ladies) and addictive - knitters say. Me, I suffer from Second Sock Syndrome (2nd anything, really), but luckily there are ways to work around that - 2 socks on 2 circulars or even 2 socks on 1 circ (my preferred method). 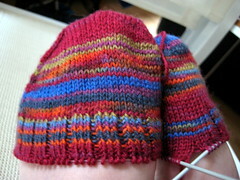 First there was a pair of purple socks, which I actually finished one by one, but can't wear because they're too tight. Then there was Nutkin, cute, but ultimately boring. Never knit its brother. Then Platypus - I never got past the toes (which is bad in a toe-up). Recently, the German pattern Treppenviertel has piqued my interest, and all bad experiences aside, I decided to give them a try. 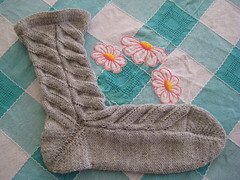 Not because I needed or even wanted a pair of socks, but because the pattern looked interesting enough to knit them despite being socks. Might not even wear them, but I swore to myself that I'll finish them. I am curious to see how treppenviertel looks finished, so I will be cheering for you!